Until recent months, the U.S. and Canada only could enjoy one hundred percent of all services of iCloud, Apple's cloud. The company is now expanding its support on European countries such as France, the Netherlands and Sweden, which means that your customers can purchase content such as movies and TV shows on a device and have them available in the other. In the official website of Apple iCloud availability and its services can already see the changes reflected. Spain is at the moment, without being listed as one of the countries where it is available to synchronize with all films apple devices. It's probably because the company still has not managed to reach distribution agreements in the country. The first time I spoke to Apple iTunes in iCloud was during the celebration of World Developers Conference in 2011. We recall that initially offered only iTunes Match (music synchronization) with the cloud in the U.S., but gradually began to expand the service. Currently, iCloud supports synchronization of music, music videos, movies, TV shows, applications and eBooks. Hopefully in Spain can enjoy all iCloud services, as is being done in other European territories. 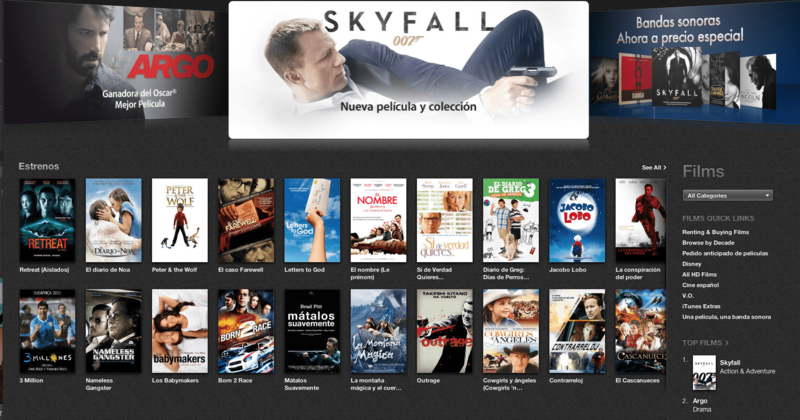 The article starts supporting Apple iCloud with films in European countries has been originally published in News iPhone .